Well, here we are, it’s that time of year again. We are about to start a brand new year full of possibilities and opportunities and new year resolutions and goals. You may have already had conversations about them and often they centre around what you are going to give up, whether it’s alcohol, cigarettes, chocolate, complaining, swearing or losing weight. We generally count it a huge success if the resolution lasts until the end of January! Apparently there is research that shows 80% of these resolutions are broken by the second week of January. Why is that? Often the initially framing is the cause; by that I mean that we are focusing on ‘giving something up’ or we going to ‘stop doing something’. That automatically creates a feeling of loss or missing out. I’m curious what difference it would make if you flipped this to a positive statement. No matter how committed we initially feel to our resolution, that commitment simply isn’t enough on its own. How often have you really drilled down to establish your ‘why’? How often have you actually planned it out? How often have you set goals that incorporate your why, your performance checks and your daily processes? As a professional coach, I work with clients who want to make a change in their life. It often comes as a bit of a shock to them that we spend so much time on clearly identifying their vision, their ‘why’, I will then support them in turning this into a series of goals at differing levels, that will enable to make their vision a reality. This takes time. To do it on our own is to set ourselves up for failure. As a coach, I have a coach that works with me as I set my own goals. It’s important to have that extra challenge and accountability. So important that it means that you will be able to achieve your goal quicker than if you did it on your own. A coach will ask you the questions that you will avoid asking yourself. These are the questions that will turn your commitment into positive action. Here are some ideas that may help you achieve your goals in 2019. The goal is too big. It’s overwhelming. You’ve tried it every year and haven’t achieved it so why will it work this time? Let’s take an example of someone who wants to run a marathon in 2019. They don’t exercise, and they haven’t run since they were at school (quite some time ago). That is a HUGE goal. So big that it puts you off. So big that you don’t make a start on it. So big that August arrives and you realise it’s too late to start. Break it down into measurable chunks. Your initial goal may be to get up half an hour earlier each morning and begin to do some exercise in the house before you start to run outside. How long will you do this for? What will be the next step? When you start to go for a run outside, what will be your route and distance? Sometimes the reason the goal is too big is that it’s too general. I want to be healthier. I want to be fitter. I want to run a marathon. Healthier than what? How will you measure or quantify any improvement? Fitter by when? Which marathon? Where is it? When do you have to register? Something this general doesn’t help us take the steps we need to take to achieve the goal. It’s great to set a goal that will stretch you; there isn’t any sense in making it too easy. Yet, if it’s unrealistic and beyond our reach then we can easily and quickly become disheartened and give up. So, if I haven’t exercised or run for years and I want to run a marathon in 2019, I may not be setting an appropriate time frame. I may want to extend the time and set an interim goal of running a half marathon in 2019. I have often coached clients around this. With the best of intentions, we can set goals that we want to believe we can achieve and it can be hard to rein in our enthusiasm. To bring them into the realms of reality requires asking yourself some uncomfortable questions, the kind we shy away from asking ourselves. With a professional coach asking some clear, and challenging questions the goal can be reframed in a way that makes it both achievable and realistic. Set goals that balance your motivation and control. On those cold rainy mornings will you really feel like going for a run? Probably not, unless you have clearly identified your vision, your why. This is so often neglected because we latch on to the first thing we think of. I want to run a marathon – does that give you? Hmmm, I will know I’m fit – ok, so when you know you’re fit, what does that give you? This can take some time, but it is worth it. I often use a client’s words back to them repeatedly which can be very frustrating for the client, but the results are worth the frustration. By persevering, they will identify the true motivation, their authentic ‘why’. Once this is established, this is what will keep you going. It can be quite an emotional process and often uncovers reasons that the client hasn’t acknowledged before. What about the control though? Well this lies in the daily process goals. Back to the marathon, what level of fitness do you need to achieve by when to do this? What level of improvement do you need to achieve each month? To achieve that monthly performance, what performance do you need to achieve weekly? These performance goals are then driven by your daily processes. What is it that you need to do daily to achieve the performance required? These may include getting up 1 hour earlier, detailing each element of your exercise routine, your mindset work, your work on your nutrition and so on. These elements are completely within your control. On those days when you are not feeling inclined to carry them out, look back to your vision – this is your motivation. It’s the balance of these goals that make this work so well, yet we often neglect one or the other. Letting everyone know about your goal. Be selective. Sometimes telling people can help us stay on track. From my own experience it felt more as if I was giving them the control rather than retaining that within me. The sad reality is also that there will be some in your circle whose response to any slip ups or challenges will be one of shame and blame. They probably don’t intend this and are trying to be motivational, but it can be extremely counterproductive. So once again, be selective in who you share it with. Finally, remember that you are human! You will have days that don’t go according to plan. There will be days when you feel you let yourself down. That is NOT failure. It’s an opportunity to reset. It’s an opportunity to review your vision and remind yourself why you are doing this. It’s an opportunity to learn how to deal more effectively with a challenge. It’s an opportunity to review your progress so far and reward yourself. 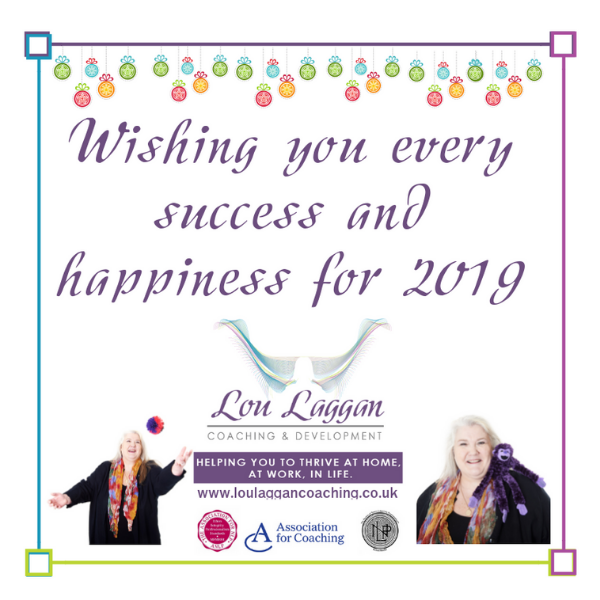 If you would like to learn more about how a professional coach can support you in achieving your goals for 2019 please contact me for a free strategy call. You may also be interested in my free FaceBook Group which offers support and accountability in making the changes you want to make to achieve the life of your dreams. Click here to join. Just read your article on setting goals for 2019, I have a couple of resolutions and it made me realise something. One resolution I am feeling quite excited and motivated by – I know why, what and how I will achieve the plan, have broken down into stages and have a realistic timescale. For this the ideas flowed. The second seems more like a punishment, stop, cut out, give up, no more …. etc. etc. I’m already thinking it was the same last January and it didn’t work. Having read your blog I thought about these and realised one I have framed positively, but the other – good grief!! So now I’m going to think about “why”…….. and “reframe” !